The drone video was posted by the Robertson County Sheriff's Office. The tornado that swept through Franklin Saturday destroyed 55 homes, a church, four businesses and a duplex, Robertson County Emergency Management Coordinator Billy Huggins said at a press conference Sunday morning. 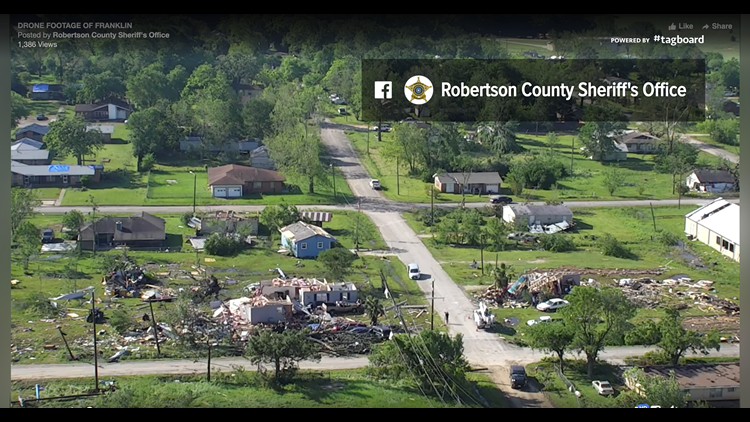 Here is video, posted Sunday, by the Robertson County Sheriff's Office showing homes on Franklin's south side completely destroyed. For those that wish to help, monetary donations should be given to the Red Cross and Salvation Army, according to officials. Volunteers looking to help with cleanup should call ahead to their local offices of the Red Cross and the Salvation Army, rather than simply arriving in Franklin, according to officials. The City said, as of Sunday, that they were comfortable with the number of food donations they revived and grateful for the help. For more information on how to help out or how to get supplies inside of Franklin, read this article.